Demand forecasting is the art of predicting customer demand to ensure there is enough stock to satisfy any new incoming sales and maintain a high service level for your business. Demand forecasting involves techniques including both informal methods, such as educated guesses, and quantitative methods, such as the use of historical sales data and statistical techniques or current data from test markets. Stock&Buy uses a quantitative technique to forecast demand for each product and variations. A mathematical procedure is used to look at a predefined number of past sales days and attempts to fit a mathematical model which is then used to forecast future demand. The forecasting algorithm is based on a mathematical model to predict future customer demand using past sales data. The algorithm does not account for discounts and high seasonality. While the result give you a hint of how well a product is selling and how much you should plan to replenish, it remains an estimation of the demand and not an exact measure. 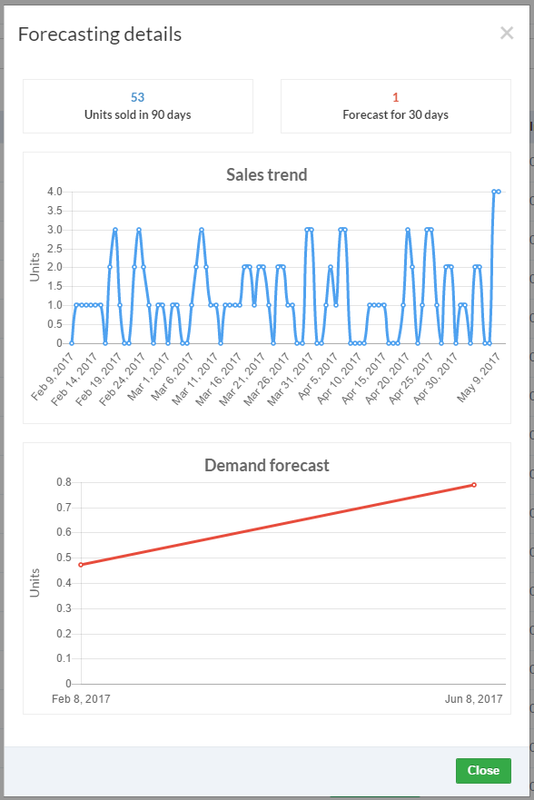 The forecasting view gives you useful insights into how your variations are selling, the total incoming quantities (these are calculated from your open purchase orders), available stock levels, allocated stock, the demand forecast and the most useful measure of all, the total number of units to purchase to fulfill the predicted demand. Each row in the table represents the forecast for each variation. Hovering over a row will show a link which allows you view details about the variation being selected. This parameters tells the forecasting algorithm how many days to look up in the past sales. The more days specified the more sales data will be used to run the forecast. Bear in mind that the more historical data to use, the slower the algorithm response will be. This parameters tells the forecasting algorithm how many days to look at in the future. Changing this value to a higher number does not influence the response time of the algorithm. Use these filters to narrow the forecasting algorithm to a specific set of products in your inventory.